One of the most interesting historical strategy game - Crusader Kings 2 - has acquired new DLC today. Crusader Kings 2: The Old Gods expansion pack opens another one historical era and gives us the ability to rule the pagan nations. 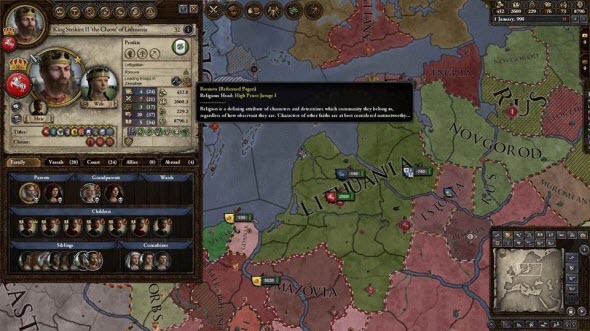 In new Crusader Kings 2 DLC you will be able to start developing your empire from 867 AD, where there were not only Christians and Muslims, typical for the Middle Ages, but also the worshippers of old and various gods. You will be able to play as a Pagan chief or a Zoroastrian leader and also will get several new opportunities and features. For example, in new Crusader Kings 2 DLC there will be an ability to loot the conquered lands and then to burn them, religionize your enemies or sail the rivers. Crusader Kings 2 DLC has been released today and now is available for PC, Mac and Linux for $14.99. And to decide if this expansion pack deserves your attention, we advise you to watch its new trailer that was published less than an hour ago.